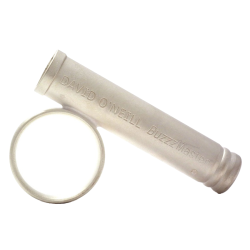 Unlike using your mouthpiece alone or lip buzzing, the BuzzzMaster by David O'Neill creates an internal air flow with unlimited range that causes a simulation of the resistance felt when playing an actual brass instrument. The BuzzzMaster is a perfect warm up, buzz enhancement, and embouchure development tool. It helps brass players target in and focus on air stream and tongue placement; in addition it helps to maintain proper embouchure formation to maximize players' buzzing for pinpoint accuracy. For any brass player who needs to be able to practice or perform for many hours a day, or for the casual player that has limited time to play or practice, the BuzzzMaster will revive a tired embouchure and will extend playing time. Manufactured exclusively in the U.S.A.